On December 5, 2018, John Monroe Woerner, Jr, age 78 of Glen Burnie, passed following a brief illness. 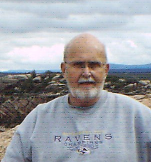 The son of John M., Sr. and Carlyn (nee Hands), he was born and raised in Baltimore, Maryland. John graduated from Poly High School as a member of the class of 1959. He joined the Westinghouse Corporation and in 1960 moved to the Glen Burnie area to be more conveniently located near his job. He would spend 40 years in his field of endeavor finally retiring as an Inspector for the Northrup Grumman Corporation in 2001. He was graciously noted on many milestone occasions for his years of dedicated service. John was married to his sweetheart of three years, Joan M. Rog, in 1960 and spent 58 wonderful years together. He enjoyed travel with Joan, particularly by train and they covered most of the 50 states over the years and visited many national monuments. His love for trains was not exclusive to working locomotives but he enjoyed the hobbie of model trains as well. He is know as a kind and thoughtful man and he would often share many of his adventures and interest with family and friends who were not fortunate in being able to have such experiences. And in the end, John will be forever remembered as a devoted family man. John is survived by his dear wife Joan M. as well as his loving Son David Matthew Blair-Woerner and his spouse Steve. He is preceded in death by a loving son Michael Scott Woerner, Sr. John's granddaughter, Breana E. Woerner who is like a daughter to him in every respect survives him as well. Among his many loving grandchildren are Ehren M., Michael S. Jr., and his spouse April and Hayden E. Woerner. His legacy is extended through great-grand children, James M. Murphy, Michael C., Landon A., and the eagerly expected John Oliver Woerner. Survivng John are his siblings Ronald D. Woerner and spouse Shirley Wilson, Mark W. and wife Lonna, Steven M. and Carolyn "Denise" Woerner and Carl Woerner and spouse Christopher Fielding. He is also survived by numerous nieces and nephews and a plethora of friends.